High Street restaurant offering great service, delivious food and a 241 cocktail offer that runs for most of the day! We were looking forward to our visit here, having had a great experience at the Leamington Spa restaurant. We were informed about the 2 for 1 cocktails and how we only had 15 minutes to order them. My Partner ordered his and then informed the waitress the I did not drink alcohol. The waitress' response was, "Oh Julia, you are boring"! I shot her a look and she proceeded to tell me about the soft drink mixes they did. Unfortunately, I wasn't interested after her comment and just had a diet coke. She then said, "I hope I haven't offended you". "Actually you have and why am I boring just because I don't drink alcohol"? The food overall was nice although I felt the content of duck in the duck wrap was pitiful. The pineapple chow packed a punch - that was lovely. If this was my first experience at a Turtle Bay restaurant, I would not be keen to go back. Went with a group of friends for my birthday meal, Service was good slow a little, food was nice but I did not feel well the next day, and did get bad tummy pains. I personally wouldn’t go there again for food but would go for drinks! Food and drinks were great. Waitress was attentive but one disappointment is that even though the waitress pointed out they do a 4 for £18 deal on the starters which we said we was doing we not only got charged the £18 but also the price of 4 individual starters which means we were charged twice. Firstly, the Map of the Northampton restaurant shows Nottingham, even the map for this feedback shows it as Walgrave, not good for finding the restaurant, but once found. Drink,excellent,  Food excellent, Service excellent and not forgetting great music. I messed up on payment and paid the the voluntary service charge thinking I was paying a tip. I hope Greta our waitress gets paid this because she played a big part in our experience at Turtle Bay. Will definitely be returning. Upon arrival we asked the waitress if they have any cocktails served in cocktail glasses, to which she says no. It is clear that she does not know as there is a couple of cocktail glasses on the table next to us, but as she doesn’t understand we move on and order something else. However, she never came back to let us order our food. We waited fourty minutes to order, then we paid for our drinks and left. The worst experience I’ve had in Northampton, we were completely invisible to our waitress. We loved Turtle Bay and will definitely be returning! There was a great atmosphere in the restaurant with great service. The food and cocktails were fantastic. I had the Festive salad the flavours were just amazing!!! Had a really tasty meal and the service was awesome. Great time. Had an amazing meal and can't wait to come back. Would have given 5* for service, but had to wait a little too long for our drinks when we arrived. Once we sat down the service was outstanding. I recommended this restaurant to my best friend and her mum but the goat curry was too salty and had to be sent back and the food wasn’t hot enough. So a bit disappointing this time round. Also the cocktails taste like they are just made up of fruit juices but hardly any alcohol for the price you pay for them. Love this place! Love the food, the drinks, the staff and the ambience. Love eating out here as it has everything you need for a great night out. We had to wait about half an hour for the main course and when we asked the waitress we were told she had just pestered the kitchen and she would pester again. Not great. Also the spiced fries were not spiced  and they tasted like they had been reheated. 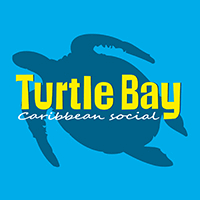 Our first visit to a turtle bay and was good to try something different . Good food and atmosphere and not bad value for money for the amount of cocktails we drank. just lacking in the service a bit for the amount of staff that where working. not clearing the table quick enough. But the guy looking after us and taking the orders was very good and friendly. If you havent been you should try soon.